Back in March we reported that Cornerstone had achieved the accolade of being nominated for the prestigious 2017 Royal Institute of Chartered Surveyors Awards, Wales Building Conservation award. Following the awards ceremony it is been announced with much celebration that Cornerstone won the coveted award. 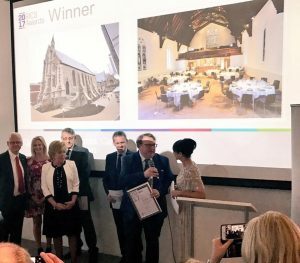 This is a great recognition for the sterling work put into renovating and conserving the former Ebenezer Chapel in Charles Street, Cardiff. It recognises the great vision, design and build effort put in by the Archdiocese of Cardiff, project manager Christian Brown,WYG Group, Petersen Williams Architects and John Weaver Ltd. Cornerstone has gone from strength to strength since the opening in September of last year. Whilst preserving the features of the historically important former chapel in the heart of the capital city. Having been awarded the Royal Institute of Chartered Surveyors Awards, Wales award, Cornerstone is now shorted for the national awards ceremony, which takes place in London later this year.